Karma has entered into a strategic tie-up with CMENDT of Hong Kong. We are supplying machine for Portable Industrial X-Ray through this tie-up. These equipment are suitable for inspection of Steel Welding and Steel Castings. Bosello High Technology S.R.L was formed in 1962 and today it is one of world's leading manufacturers of Industrial X -Ray Inspection systems for NDT Controls. - The x-ray tube was to be fitted at the loose end of the boom in cantilever fashion. - The boom had to be adjustable along Z axis to accommodate varying pipe diameters. 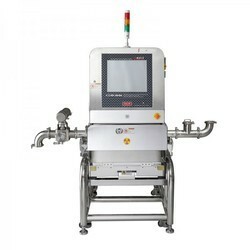 X-Ray Inspection System used to thruoghly inspect solder joints and invisble defects in PCB.